I find there are few more beautiful locations than a mountain lake or pond at sunrise in the summer. The air is cool while the smell of the pine forest is intoxicating. Nymph Lake which lies above Bear Lake and below Dream Lake in one of the most popular areas of Rocky Mountain National Park can exemplify these mornings as much or more than some of the more iconic lakes in Rocky. This July morning on Nymph Lake was one of those kinds of summer mornings that you dont want to see end. 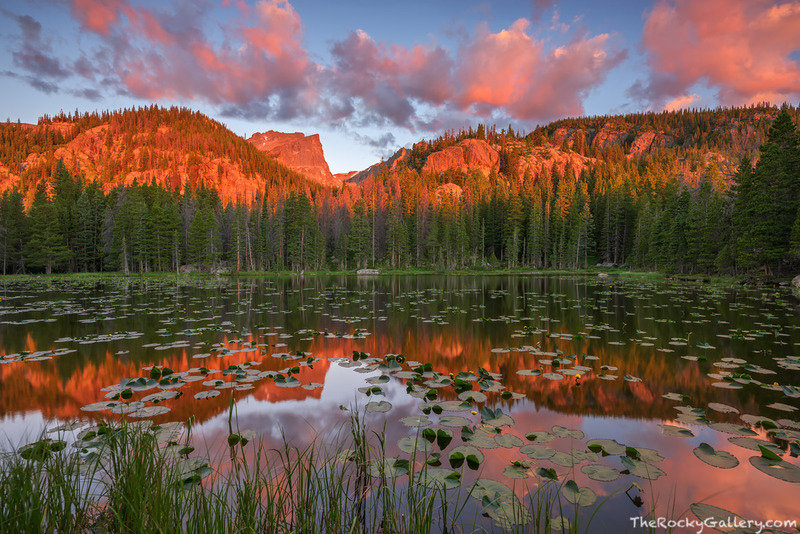 The sunsirse skies put on a colorful display as summer pond lilies bloomed and floated on the surface of Nymph Lake. Hallett Peak glowed in the distance as the start to this summer day began. Photo © copyright by Thomas Mangan.